Dýrfinna Torfadóttir, gullsmiður starfrækir vinnustofu sína að Stillholti 16-18 Akranesi. Þar vinnur hún að skartgripagerð, skúlptúrgerð og gerð lágmynda. Dýrfinna Torfadóttir er fædd 1955 í Reykjavík en ólst upp á Ísafirði og bjó þar eftir að námi lauk og þar til hún fluttist til Akraness haustið 2001. Hún lærði fag sitt á Akureyri og í Valdres, Noregi og lauk meistaraprófi í gullsmíði árið 1983. Hún opnaði vinnustofu og verslun sama ár á Ísafirði sem enn er starfrækt Þar er boðið upp á handunna skartgripi og gjafavöru. Dýrfinna hefur tekið þátt í fjölda sýninga, bæði einkasýninga og samsýninga og hlotið margvísleg verðlaun og viðurkenningar. Meðal annars hlaut hún 1. verðlaun fyrir tískuskartgrip ársins árin 1997, 1998 og 1999. Hún er fyrrverandi formaður Félags íslenskra gullsmiða. Dýrfinna hefur sem skartgripahönnuður skapað sér sérstakan og persónulegan stíl sem einkennist af frumlegri og oft óhefðbundinni efnismerðferð og djarfri útfærslu. Með þessu hefur hún skipað sér í röð hinna eftirtektaverðustu gullsmiða og skartgripahönnuða á Íslandi. Skartgripir og önnur verk eftir Dýrfinnu eru til sölu á Hótel Sögu, hjá Epal Design, í Flugstöð Leifs Eiríkssonar, hjá Listhúsi Ófeigs í Reykjavík og í versluninni Gullauga á Ísafirði. Curriculum Vitae: Dýrfinna Torfadóttir was born in 1955 in Reykjavík, the capital of Iceland. She was brought up in Ísafjörður, North-west Iceland, and lived there after finishing her studies. In 2001 she moved to Akranes, a town adjacent to Reykjavík, and in Akranes she operates a small studio-workshop and gallery. Ms Torfadóttir pursued her goldsmithing studies in Akureyri, North-Iceland, and in Valdres, Norway, and obtained her certificate as master goldsmith in 1983. 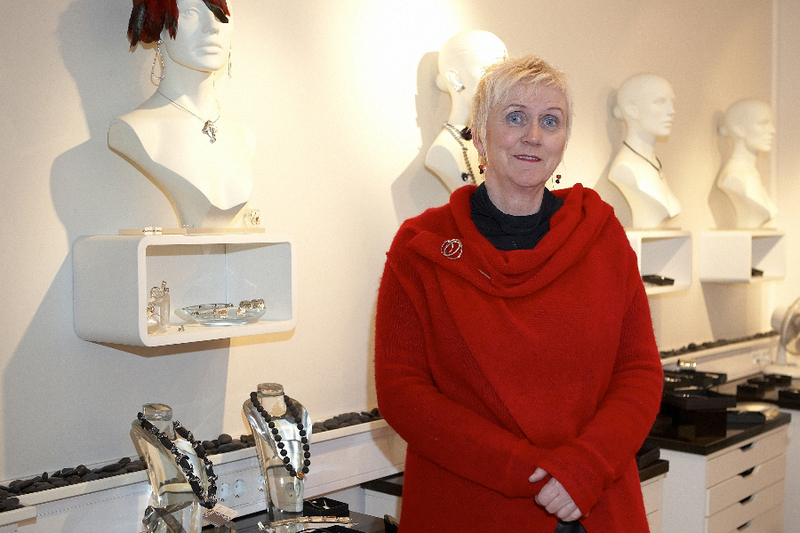 That same year she opened a studio and a giftshop in Ísafjörður, the latter of which she still runs there with handcrafted jewellery and giftware on offer. Ms Torfadóttir has participated in a number of private and group exhibitions and has received various prizes and awards. She was, for instance, awarded the First prize for the Iceland Fashion Piece of Jewellery in the years of 1997, 1998, and 1999. 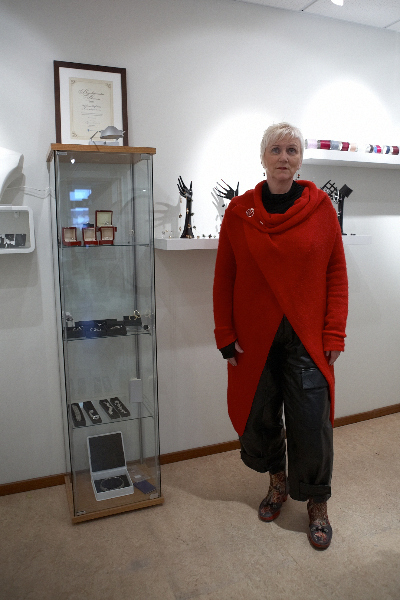 Jewellery and other creations of Dýrfinna Torfadóttir can be found and bought in the airport shop in Keflavík (Flugstöð Leifs Eiríkssonar), at Hotel Saga (in Reykjavik), in Epal Design (Reykjavik), in Listhús Ófeigs (Reykjavik) and in Gullauga (Ísafjörður). 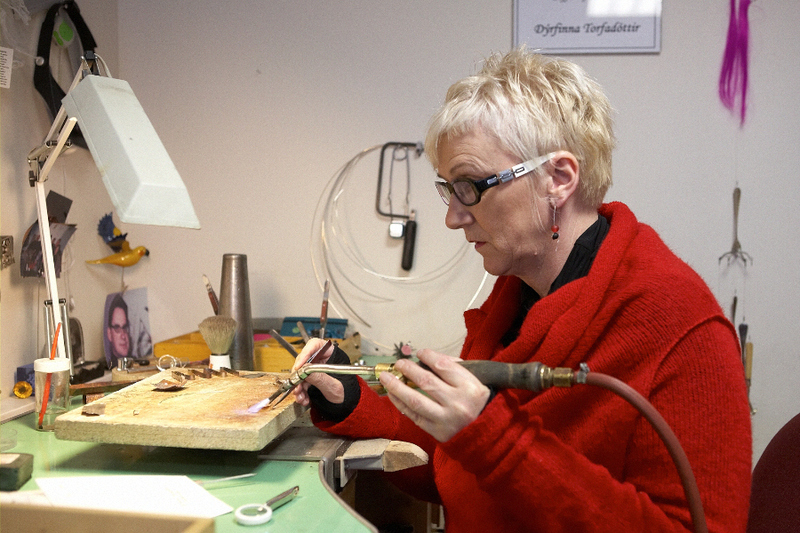 A few words about Ms Torfadóttir’s work and characteristics as a goldsmith and designer. Dýrfinna Torfadóttir has developed a distinct, personal style as a designer of jewellery, characterized by an original and often non-conventional use of materials and a daring execution. Icelandic nature is a notable influence in most of her work, and she is considered among the most significant goldsmiths and designers of jewellery in Iceland.